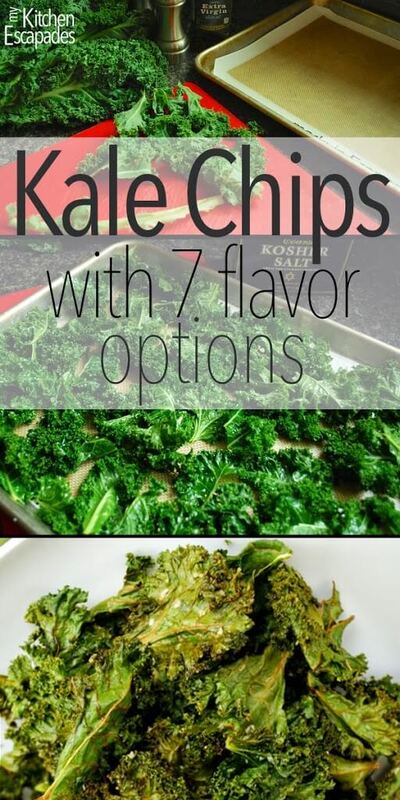 Learn how to make kale chips that are not only delicious, but easy to bake in the oven as well. 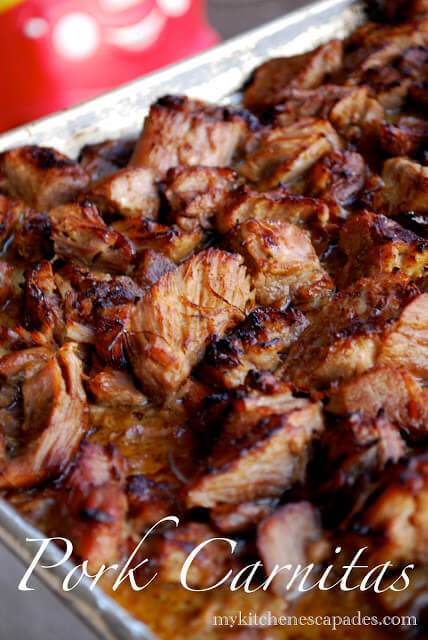 This recipe comes with 7 different flavor options so you can make them how you want. This healthy snack idea is low carb, gluten free and vegan. 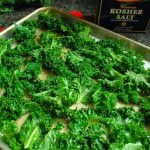 Baked kale chips might seem a bit intimidating but they really are an easy recipe that give you perfectly crispy kale chips every time. 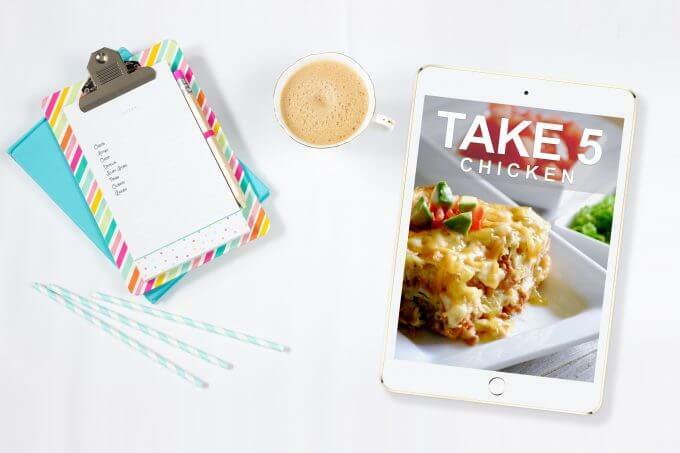 With this post, I know many of my regular readers will probably think they’ve somehow clicked onto the wrong blog because though I have always had a great balance between healthy and indulgent recipes, this one might just take me over the edge a bit in your mind. But have a bit of faith in me and stay with me for a few moments more…please! I am in the process of training for my first triathlon in almost 7 years. My last one was right before I found out I was expecting baby #5. Seven years later, I actually now have 6 kids, am 42 years old and know that if I don’t get back into it, it may never happen again. I am grateful to my friend who was brave enough to pick up her phone and ask me to race with her. I forgot how completely empowering the training process can be. I know I will never win any race I run, whether it is a triathlon or a running race, but that is not why I compete. I enter these races because it gives me a goal. When I have something I am working towards, it gets my rear end out of bed early in the morning and out pushing myself harder than I ever would if I were just “exercising.” I also make it a habit to tell my friends and family that I am training because then I feel accountable to them when they ask me how it is going and how much longer I have until the race. Part of my training is to keep my eating clean….well, except for Sunday dinner which is my one meal every week where I let myself relax and enjoy some good home cooking!! The other day, I was desperate for something crunchy and salty to fulfill a craving. I hope you can all relate 🙂 I knew it was time to learn how to make kale chips. This kale chips recipe had been pinned on my Pinterest board for over a year and I knew the time had come to stop being a chicken and give them a try. Honestly, I thought these would go in the garbage after I spent the time and money making them but I was pleasantly surprised! They are thin, crisp and wonderfully salty. They cured that craving and even a few of my kids were brave enough to give them a try. I have a few flavoring options for your kale chips seasoning selection so give a few different ones a try, or use your creativity and come up with your own. I was thinking I needed to come up with a spicy buffalo version next because that is a favorite flavor of mine. 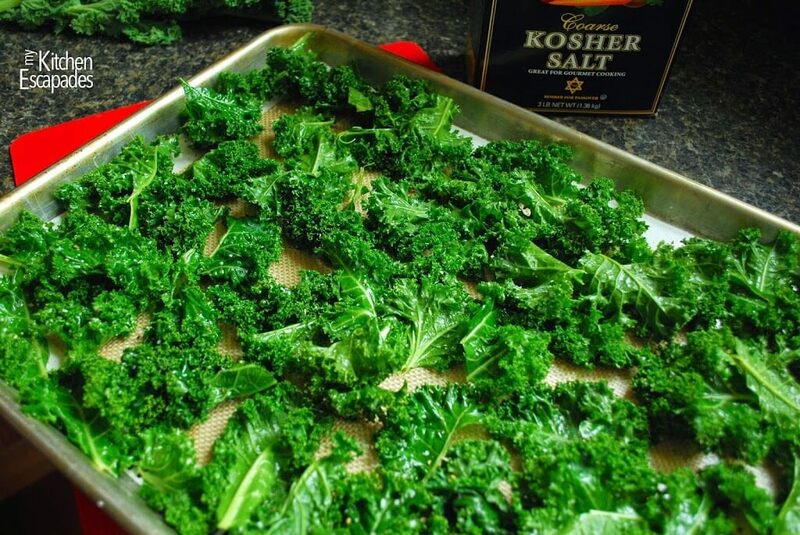 So read on to learn how to make kale chips at home so you can enjoy them as much as I did. 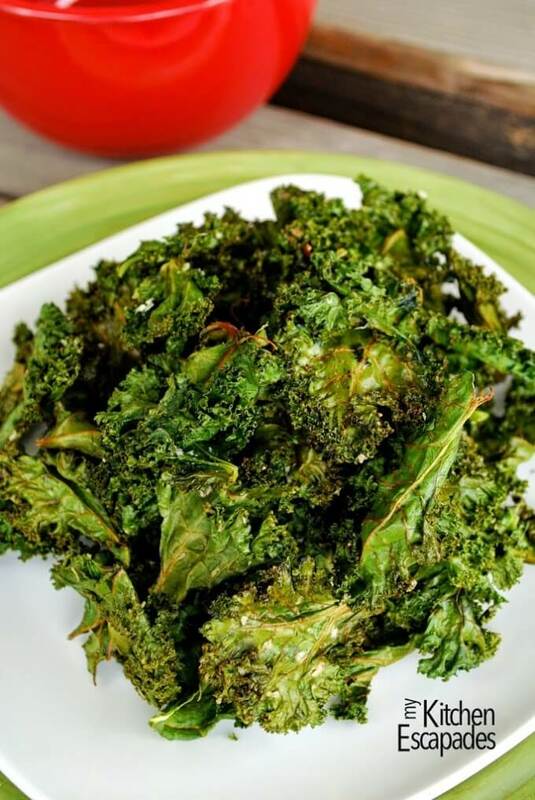 This kale chips recipe is healthy, low carb and gluten free. 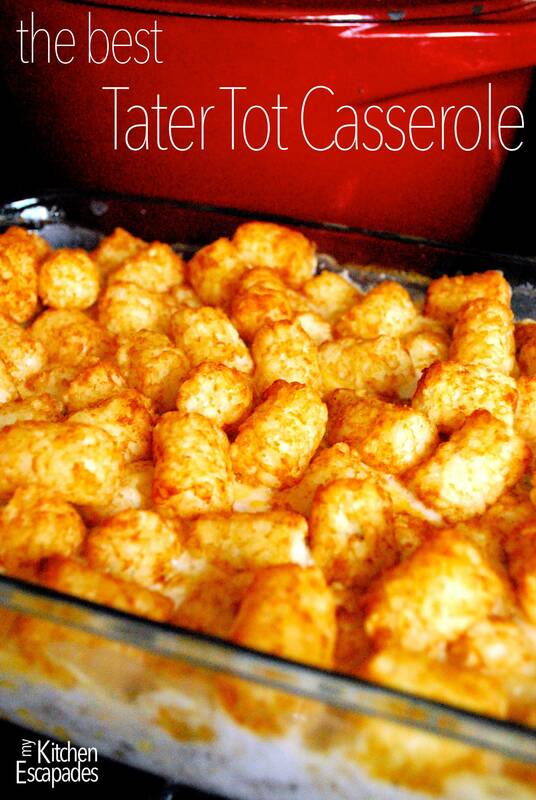 Find your favorite flavoring to add! 1. Preheat oven to 300 degrees. Line a large cookie sheet with parchment or a Silpat liner. 2. Use your hands to rip off pieces of kale from the stems, around 2 inches across. They can be any size you want but be sure all your pieces are about the same size so they cook at the same time. You don’t want pieces of the main stem because they are very fibrous. 3. Place pieces of kale on the cookie sheet and drizzle on the oil. 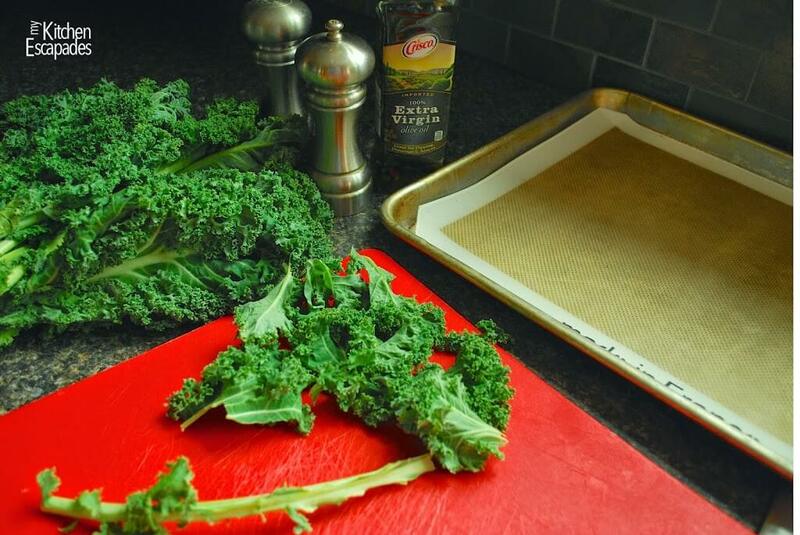 Using your hands, rub the oil into the kale pieces, being sure to completely coat all sides of the kale. It takes a little time, but just keep rubbing it all together. Add any additional flavoring options, listed below, if desired. 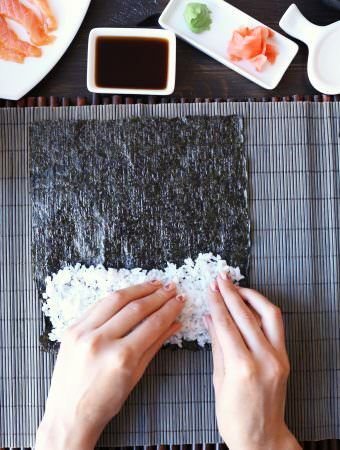 Sprinkle with salt and pepper, then bake for 20-30 minutes. Your time will depend on the size of your pieces. Cool and store an airtight container. How long will they stay fresh?? If you keep them in an airtight container, they would be good for around 5 days. Hi I love these chips, but I tired storing them in an airtight container (plastic) and they got very soggy/limp. Any suggestions? Thank for the question Kitty! I would try a ziplock bag if the container isn’t working. Mine last for at least a week and do not get soft at all. I wonder if your chips could use a bit longer of time in the oven. That sounds really interesting Johaan! I would love to hear how they turn out. Hey Gabriela! Serving size is up to you I guess. 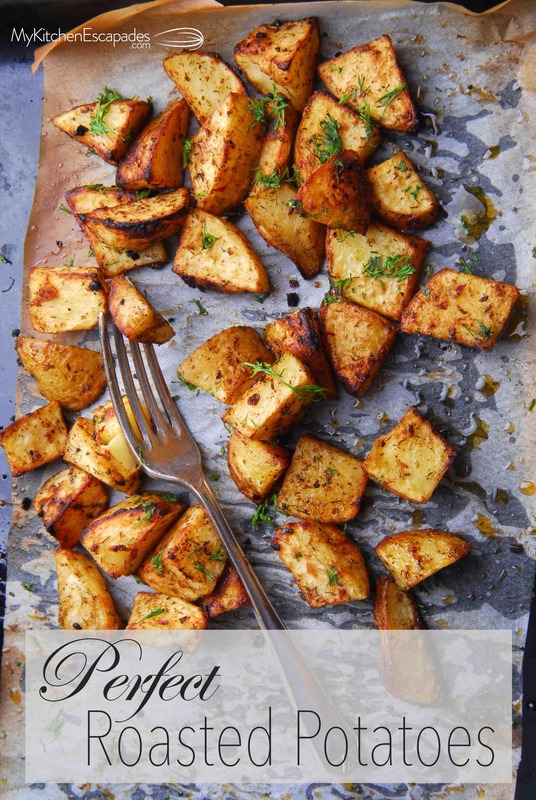 I don’t have nutritional information for this recipe but there are many great online nutritional calculators you can use. Can I use coconut oil instead of olive? Hi Carmen! I’ve never made it with coconut oil but I think it would work. Let me know how they turn out!